Nearly four hundred species of birds are known from Mississippi, including nine woodpeckers. These birds are well known for excavating nest and roost cavities in trees and feeding on insects, spiders, other small animals, and at times fruit and seeds. 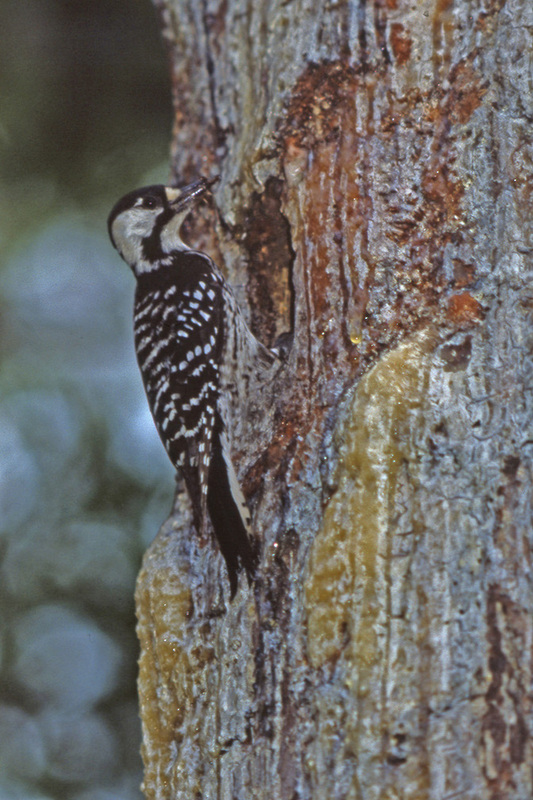 Mississippi’s woodpecker diversity reflects its rich forest diversity: pine flatwoods to the south, higher pinelands through the center and east, elements of Appalachian mixed forest in the northeast, swamp hardwood forests along the great rivers, and lesser areas of natural savannah and prairie. Such habitat diversity allows woodpeckers to specialize, minimizing competition by exploiting unique resources or similar resources in unique ways. Eight woodpecker species have found conditions suitable for nesting in the state. The yellow-bellied sapsucker (Sphyrapicus varius) is only a winter resident, some arriving from northern breeding areas as early as September and others staying as late as early May. These birds leave behind telltale signs of their searches for food—sapwells, which are rows of tiny holes on tree trunks and limbs. Those that produce a sweet sap are kept open by sapsuckers, who return to them periodically throughout the day to gather the sweet liquid. Horizontal rows of holes are exploratory sapwells. When a sapsucker finds sweet sap, it follows the vessel vertically with new sapwells. Contrary to popular belief, the sapsucker’s holes do not kill the tree, although the tree may die. Trees produce sweet sap when mobilizing nutrients to fight off an infection such as a fungal disease. Thus, the presence of numerous vertical sapwells on a tree indicates that the tree is sick. More female sapsuckers than males visit Mississippi. Males stay closer to breeding areas and acclimate to the colder weather, allowing them to return early to claim prime nesting areas. Red-headed woodpeckers (Melanerpes erthrocephalus) and northern flickers (Colaptes auratus) nest in the state, but their resident populations are augmented each fall by migrants from farther north. Both of these birds tend to use more open habitats and often go to the ground for food, meaning that northern populations must migrate south when snow blankets the ground. The red-headed woodpecker often sallies out from tree limbs, fence posts, or utility poles to capture flying insects or to seize grasshoppers, crickets, and beetles on the ground. Red-headed woodpeckers also eat fruit in season. The northern flicker (Colaptes auratus) feeds extensively on ants and is the least arboreal of Mississippi woodpeckers, sometimes forsaking nests in tree cavities in favor of holes in the ground, thus allowing them to exist in somewhat treeless areas such as the Mississippi Delta. Red-bellied (Melanerpes carolinus), downy (Picoides pubescens), hairy (P. villosus), red-cockaded (P. borealis), pileated (Dryocopus pileatus), and ivory-billed woodpeckers (Campephilus principalis) are (or were) permanent residents in the state. Most have retained healthy populations throughout the state, although the red-cockaded is endangered and now limited to localized populations in central and southern Mississippi, and the ivory-billed woodpecker may be extinct. Red-bellied woodpeckers may be Mississippi’s most common woodpecker, found in cities and towns as well as in diverse forested areas throughout the state. Red-bellied are generalists among woodpeckers, feeding on a diversity of insects, spiders, small lizards, fruit, and nuts. They also readily come to bird feeders but can be most easily attracted by half an orange impaled on a nail driven into a tree or fence posts. Red-bellieds are easily identified by the black-white barring on their backs. The downy woodpecker is sparrow-sized and Mississippi’s smallest woodpecker. A resident of city yards and forest edges, the downy has the advantage of being able to use small-diameter branches for its nest and roost cavities. One of the downy woodpecker’s unique characteristics is that males (with a red patch on the back of the head) feed in different places than females (which have no red on the head). Males generally glean small insects and spiders from the surfaces of tree limbs less than two inches in diameter but also find insects on or in dried weed stems. Females, conversely, usually hunt on larger trunks and limbs. This division of the available habitat is believed to reduce competition between the sexes and thus strengthen the bond between members of a pair. The hairy woodpecker is a larger look-alike of the downy—white-breasted below and black above, with white lines above and below the eye, a white stripe down the middle of the back, and white outer tail feathers. The smaller downy has a tiny, sharply pointed bill that is shorter than the head and has black spots on its white outer tail feathers. Hairy woodpeckers are much less common than downy and are usually found in mature forests. The endangered red-cockaded woodpecker is perhaps the most specialized of Mississippi woodpeckers. These birds differ from all other woodpeckers in almost always nesting in the trunk of a living pine. They also characteristically excavate and maintain small holes above and below their cavity entrances, causing a continuous flow of sticky gum that is believed to protect them from climbing rat snakes. Other woodpeckers only occasionally nest in living trees; in Mississippi the red-bellied and red-headed woodpecker and the northern flicker frequently usurp the cavities of red-cockaded woodpeckers for nests or roosts. The average age of a tree housing a red-cockaded woodpecker nest is about one hundred years, because the birds depend on having the heartwood of the tree softened by a fungus that begins to enter the tree through broken branch stubs a decade or two earlier. Because of the fungus, however, foresters harvest the pines at an earlier age, leading to the massive loss of red-cockaded woodpecker habitat. The conversion of forestland to other uses and the restriction of natural fires, which create the open, parklike pine stands the birds prefer, are the main factors that have made this species endangered. Although the red-cockaded woodpecker plays many positive roles within its ecosystem, destroying insect pests and creating nest sites for more than fifty other animals, protection of this species under endangered species laws has created problems for the forest industry. The pileated woodpecker, with a wingspan of about twenty-eight inches and a length from the tip of its bill to the tip of its tail of about eighteen inches, is the largest woodpecker most Mississippians will see. Early settlers to the region called it Indian hen because it often feeds on the ground on ants and grubs found in rotting logs, is about the size of a small chicken, and was occasionally eaten. Early visitors to the region also sometimes referred to it as the Lord God bird: it was so large that when people saw it, they exclaimed, “Lord God, what a woodpecker!” This designation was also applied to the similar but slightly larger ivory-billed woodpecker. Because of their diet of ants and practice of feeding on the ground and downed timber, pileated woodpeckers have not only survived but seem to have thrived in Mississippi. As planted city trees have grown larger, pileated woodpeckers have moved into city neighborhoods, at times to the dismay of humans, who tend to remove from urban areas the dead trees that pileated woodpeckers use for feeding and nesting. In addition, humans often use natural wood siding on homes: in the absence of suitable nesting sites, the pileated woodpecker sometimes begins to excavate the siding. The ivory-billed woodpecker is (or was) even larger than the pileated: about thirty inches from wingtip to wingtip and twenty inches long. It is, however, either the rarest bird in America or one of the most recently extinct species. Known only from the southeastern United States and Cuba, the ivory-bill was last documented in Louisiana in 1944. Sightings in Mississippi in the 1980s were never confirmed, nor were widely publicized recent sightings in Arkansas and northwestern Florida. The ivory-billed woodpecker differs from the pileated in subtle respects, most obviously its bill, which appears to be much larger and heavier and is very white, and a shield of white on the folded wings that cross the lower back of a perched bird. The pileated has survived while the ivory-bill was brought to the brink of extinction in part because both Native Americans and early settlers saw the bill of the ivory-bill as having value and hunted the birds extensively. In part their fate was likely also sealed by their dietary preferences. They favored the nearly three-inch-long, half-inch-diameter grubs of very large beetles that were associated with very large trees. As large trees disappeared and forests were cleared or fragmented, the large beetles no doubt declined, and with them the ivory-bill.